Liverpool captain Steven Gerrard is set to miss four matches, including the first two World Cup qualifiers, because he needs a groin operation. Gerrard, 28, will undergo the operation on Thursday and will be out for "10-15 days", according to boss Rafa Benitez. Gerrard played through the pain barrier on Wednesday to help Liverpool into the Champions League group stage. England travel to Barcelona to play Andorra on Saturday 6 September and face Croatia away four days later. 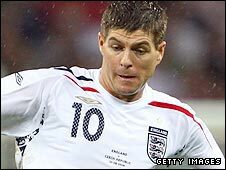 What do you make of the timing of the op and how much are England and Liverpool going to miss Gerrard? And in the Premier League he is set to miss the matches involving Aston Villa on Sunday and Manchester United on 13 September. "I'm disappointed because Gerrard will have an operation on Thursday," added Benitez. "He has a groin problem, we knew it could be like this. He had a problem and now he will have an operation and will be out for 10-15 days. "He needs to have it because he is having pain with it. When he went with the national team we knew he had a problem and in the first leg too. "I was talking with the doctor on Tuesday and on Wednesday we talked with him. He said he would play with pain and after it he would have an operation." Gerrard's Liverpool beat Standard Liege 1-0 with a last-gasp extra-time goal to win 1-0 on aggregate and sneak into the group stage.